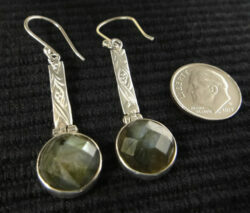 Artisan labradorite jewelry from Glassando includes many labradorite pendants and labradorite earrings. 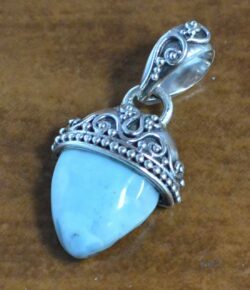 This lovely gemstone often looks grey at first glance, but reflects flashes of blue and green when light hits it, making it an excellent choice for lovers of grey jewelry, blue jewelry, green jewelry, and unique natural stone jewelry! 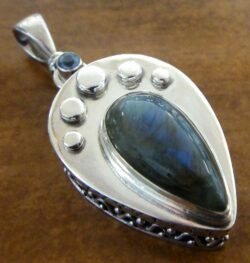 Handmade labradorite jewelry from Glassando includes pendants, earrings, and labradorite and sterling silver jewelry! 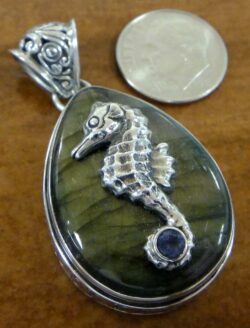 Our selection also features labradorite and peridot jewelry, labradorite and blue topaz jewelry, labradorite and iolite jewelry, and even carved labradorite skull jewelry! In addition to what is featured on our website, you can view a large selection of handcrafted jewelry inside our retail store. Glassando is a locally owned boutique jewelry store in downtown Iowa City. We are located inside the Old Capitol Town Center, which is often also called the University Capitol Center or the Old Capitol mall. Parking is available in the Capitol Street Parking Ramp, which offers your first hour free of charge! Although Glassando does not have an outside entrance, our store can easily be accessed on the building’s first floor, next to GNC. 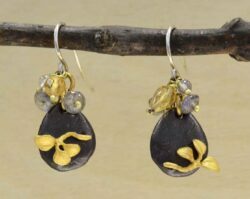 Stop by or explore our website to see lots of artisan handcrafted jewelry!